Need Gutter Cleaning in the Darwin area?Jim’s Mowing offers Gutter Cleaning services in Darwin and would be delighted to help. We even offer same day gutter cleans if our scheduled permits. Just call Jim’s Gutter Cleaning in Darwin on 131 546 or you can book a gutter cleaning job online for a time that suits to get your gutters cleaned, or schedule a free, no obligation quote. Gutter Cleaning prices can vary depending on the size, height (one story or two) length and overall state of your gutters currently, so it is usually best for us to view the property first to ensure an accurate estimate of price, and we can provide a written quote detailing costs. We can complete all aspects of gutter cleaning and maintenance, be that a one-off clean, or regular service that ensures that leaves are removed; and drains and gutters are not blocked before storm season and are maintained well throughout peak fire season. 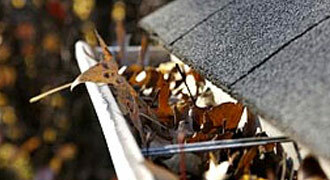 We can also install gutter guards to prevent future build up of leaves and debris in your gutters. Don’t risk your health and safety by climbing up a ladder yourself to clean house gutters. We are sure you have better and safer ways to enjoy your free time. Our fully trained gutter cleaning team have all the equipment and know how to clean your gutters safely and efficiently. Be assured that all Jim’s Mowing staff are required to have a current police check, are fully insured and fully trained. Plus, our work comes with a 100% Satisfaction Guarantee. Our customer reviews illustrate our team’s commitment to great customer service! Remember, we also offer more than just gutter cleaning services in Darwin. Our services extend to comprehensive gardening maintenance and services, lawn mowing, edging and trimming, block slashing, tree, shrub and hedging trimming and pruning, landscape design and hard landscaping services, irrigation systems and rubbish removal. Call Jim’s Gutter Cleaning Services in Darwin on 131 546 now or Book a Jim’s Gutter Clean online, today. Your gutters will be expertly cleaned, all leaves and rubbish removed giving you more time to enjoy yourself! So call Jim’s Gutter Cleaning now on 131 546. Need help with more than just Gutters? Jim’s provides more than 50 Franchised Services – and we come to you! Be it Pool Maintenance, House Cleaning Services, Home Security & CCTV; Car Detailing, Carpet Cleaning, Pressure Cleaning or even a Dog Wash . . . View Jim’s full list of on site services here. The fronds were left on the neighbours verge..we moved them ourselves.